Well, if I feel like I'm too busy now, just wait until conference season gets started again next month. We have planned on more conferences this next year than ever before. Woohoo. I love conferences. I can't wait. We have several on the calendar for 2010, but hey--let's get through this year first. Good grief. We usually have one of the plotters with us to print charts on the spot, and we always have specials on several of our products. Be sure to come and see us at one of them. We haven't decided on FGS and NGS 2009 yet. Since we have so many other good, big conferences to choose from, and because of the distance, we are waiting to see what gas prices are doing. Are you going to these? September 2nd - 5th Federation of Genealogy Societies Conference, Little Rock Arkansas. Let us know and we may decide to go too. Do you know of any others we should try? Back to the Marathon Blog Series. There are lots of other principles on this topic I have wanted to share. Earlier I mentioned that probably the biggest principle of inspiring your family with your family history is to have it infused profusely into every aspect of your life. If you are excited about it, and if you have a good relationship, the more inclined your family is to be excited about family history too. One of the ways you can have your family history more present in your life is to get it out of the books, scrapbooks, off the computer and etc, and have it in front of your eyes every day. 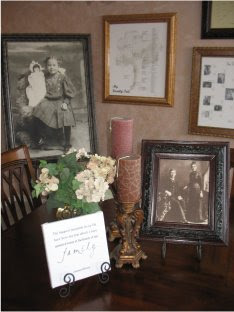 Displaying your family history in your home is a great way to get the people around you asking questions and being more aware of your family history. Would they approve of how I am using my resources right now? Am I raising my children to carry on the best things this family has tried to promote? What am I doing to improve this family? Is the current crisis going to be important in the span of my lifetime? What are these day to day activities adding up to be in my life? What is going to be important about me to my descendants? How am I going to be remembered? Do I need to change that? For those you live with, or anyone who visits, displaying your family history can create interest and curiosity. The family history is everywhere in our house. It always has been. And anyone who has been here knows that our family's history is important to us. My kids know the stories around the pictures and the heirlooms. They know what these people looked like and that they were real people. But I also get asked questions by extended family and friends that come and visit. You might present a family history display item to the person you want to interest. My sister made calendars for our family this past Christmas with a bunch of family photos and all the important family dates noted. It is a beautiful calendar that she put together online and had sent to her. Many genealogy programs will also create calendars with your ancestors' birthdays and anniversaries and etc. For young children, displaying your family history in a geographical way can also be educational. You could put up a map showing where your ancestors are from, or you could mark the migration of members of ancestors and how you came to live where you do now. 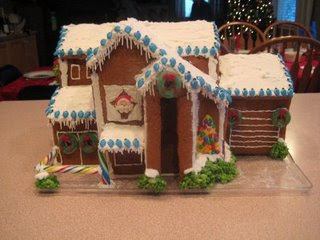 You could also incorporate quilts, pillows and etc. All sorts of the things you use or decorate your house with can be turned into lessons on family history. Several years ago I made a quilt out of the photos in my parent's wedding album. As much as I would love to spend time looking at the wedding album, I've seen the quilt alot more often. Fabric Paint, Photo transfers, Embroidery, can be used to display your family history. So however you do it, get some of your family history out where you can see it this week. And then tell someone about it and why it is important to you. We had a crazy December. Each end of the year is getting busier and busier as Generation Maps grows. I'm happy to report that the holiday season was good for us and Generation Maps is doing well. I've begun to think this company is fairly recession proof as we continue to see growth in our contacts and sales. When you are involved in something important, people value that no matter what. And the people we worked with this holiday season expressed to us many times how meaningful and important family history is to them and how excited they were to be able to share it with their families. It was nice to be able to help so many people with something that they love and help them express the importance of their families and connections. So after the long hours leading up to Christmas I took a break (as you have seen from my unusual quiet on the blog and facebook). I got some sleep. And my children were happy to see me looking at them instead of the computer screen. Played Monopoly for the first time in years. Now that I own a business, it takes on a whole new meaning--I quite enjoyed it. I just might turn out to be a tycoon in this life, although I'm sure my son will outdo me there. Stopped cleaning up the house for a week. I highly reccomend it. Everything is still here. And clean-up-able now. Went to several movies and out to eat several times to just relax. We were snowed in on Christmas day though, which made for a nice peaceful holiday--new soft slippers and everything. I hope you and yours had a nice holiday season as well. Now it is back to the treadmill, and the grindstone :-). Happy to go back to the things I love. I still have several more entries on the "Sharing your family history with your family" --slowest blog series ever. And we are working on several really fun, ornate custom charts for customers who were willing to wait until after Christmas. I'll let you know how it goes.